Tag line: "Until this moment, the shield was his only bed...the sword his only bride!" 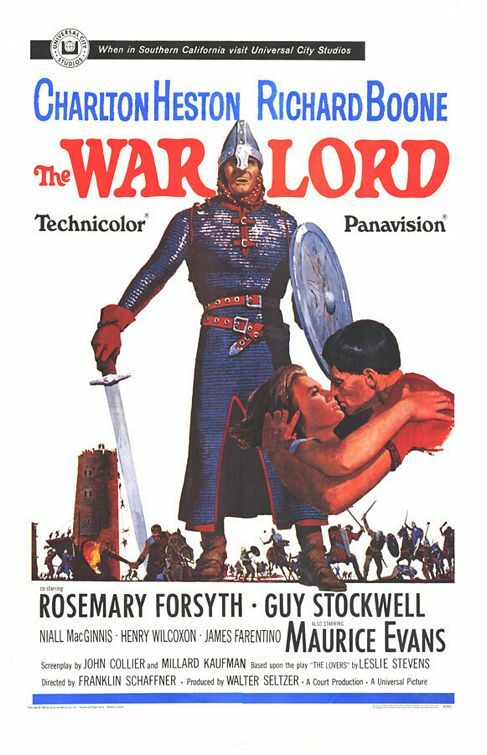 With its rousing score, period costumes, and sweeping battle scenes, 1965’s The War Lord has the look and feel of a Hollywood epic. But beneath all its magnificence lurks a love story for the ages, and thanks to director Franklin J. Schaffner, the characters, and not the spectacle, are what drive the movie forward. It’s the 11th century, and Chrysagon de la Cruex (Charlton Heston), a Norman knight, has been ordered by his lord and master the Duke to defend a Celtic village, which is in danger of being attacked by Frisian raiders. Joined by his brother Draco (Guy Stockwell) and most trusted comrade Bors (Richard Boone), Chrysagon takes up residence in a small tower overlooking the countryside, prepared to do the Duke’s bidding but none too happy that the locals, ignoring the efforts of a Christian priest (Maurice Evans), still practice their “heathen” religion. While out riding one day, Chrysagon spots a beautiful peasant girl working by the side of the river, and falls instantly in love with her. Her name is Bronwyn (Rosemary Forsyth), and she is about to be married to Marc (James Farentino), the son of the village elder. Though he wants to maintain a cordial relationship with the villagers, Chrysagon is nonetheless persuaded by his brother Draco to evoke his “right of first night” with Bronwyn (an ancient custom that allows the local authority to bed a virgin bride on her wedding night). Once the ceremony is completed, Bronwyn is brought to Chrysagon, and during their time together she confesses that she is in love with him as well. So, when the sun rises the next morning, Chrysagon breaks tradition by refusing to allow Bronwyn to return to her new husband, an act that forces the villagers to seek an alliance with a Frisian Prince (Henry Wilcoxon), whose young son (Johnny Jensen) is being held prisoner by Draco. Is Chrysagon ready to go to war for love, or will his duty to lord and country influence his actions? Having already portrayed larger than life characters in movies such as Ben-Hur and El Cid, Charlton Heston was the perfect choice for the role of the heroic yet lovesick Chrysagon, while Guy Stockwell is every bit Heston’s equal as Draco, Chrysagon’s occasionally treacherous brother. In addition, the musical score (by Jerome Moross) and the costumes (designed by Vittorio Nino Novarese) are first-rate; and kudos to director Schaffner, who somehow managed to make Southern California look exactly like France in the Middle Ages (I was shocked when I discovered The War Lord wasn’t filmed on-location in Europe). Yet all this, as well as the electrifying battles (the Frisian siege of the tower fills a fair portion of the movie’s third act, and is a thrill a minute), plays second fiddle to the characters and their relationships, not only the central love story (which is very effective), but also the sibling rivalry that develops between Chrysagon and Draco (leading to some tense moments between the two). As he would do later on with Patton and Papillon, Franklin Schaffner created an elaborate, fascinating world for The War Lord, then made his characters the most interesting aspect of the film.